Omelettes can be as plain or as varied as you like! This easy Spanish-style omelette recipe idea has plenty of colour and flavour that will provide an ample supper in a short time. It is worth buying a decent omelette pan. With the right care it will last for years and produce consistently good omelettes (and pancakes.) If unavailable, use a non-stick frying pan. The Spanish omelette is different from the plain French omelette because it contains potatoes and other vegetables and so has to be cooked over a lower temperature for a longer period-without going rubbery though! Known as ‘tortilla de patatas’ in Spain, regional variations can differ quite considerably, but it is a popular versatile dish that is served in tapas bars in most regions. 1. Melt half the butter in your omelette pan and fry the onion, or pepper, until soft. Remove them from the pan and drain on absorbent kitchen paper. 2. Cook the potatoes and mixed vegetables. Drain thoroughly and keep warm. 3. In a large mixing bowl, beat the eggs together with the water. 4. Add the hot diced potato, garlic and mixed vegetables to the egg and water. 5. Next, add the softened onion or pepper. 7. Mix the potato and other vegetables with the egg and water combination so that they are all coated with the mixture. 8. Melt the remaining butter in the omelette pan. 9. When the butter becomes hot, but not brown, add the mixture to the pan. 10. Cook the omelette over a high heat for the first 3-4 minutes until the egg begins to set at the bottom. Use a palette knife to draw the runny egg at the sides to the centre of the omelette. This helps to keep the omelette a good shape, too. 11. Turn the heat to its lowest setting and let the omelette cook through, slowly, for about 15 minutes. Have a plate large enough to cover the top of your pan, like a lid does. When the omelette has ceased to be runny, remove it briefly from the heat. Next, place the plate over and flip the pan so the omelette is transferred to the plate. The omelette is now upside down. Slide it from plate to pan, so what was the bottom of the omelette becomes the top. It is easier to turn the omelette this way than with a palette knife or spatula; because a Spanish omelette is much heavier than a French omelette and may break up more easily. When cooked right through (should take no more than 25-30 minutes altogether) either serve the omelette hot with a salad and a glass of Spanish red wine (optional!) or leave it to cool, then wrap in cling film and refrigerate. 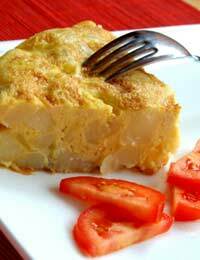 Slices of cold Spanish omelette make a great snack while you’re out and about, especially as part of a picnic. It’s one of those surprise foods that taste as good, if not better, cold! Alternatively, cut it into cubes and serve with drinks (and cocktail sticks) as a pre-dinner nibble. For those who like it hot...use some chopped jalapeno peppers instead of onion or green pepper. Delicious!